Debashish started strumming at the age of three - on a full size Hawaiian lap steel model! His father, a singer of classical Indian music received the instrument from an admirer but didn't have any inclination to play it. One day Debashish discovered it, and almost at once he was working out little tunes. " I barely could put my hands on the strings, and the slide-bar was big for me, so I used to hold it like a spoon," he recalls, laughing. "My father gave me the guitar and my mother showed me the notes to play. I started off playing the national anthem and other well known songs." Like his sister Sutapa, a classical vocalist and brother Subhasis, a brilliant tabla-player, Debashish was taught the rudiments of music by his parents. "We all got the basic training by singing, which is the traditional way for musicians in India to learn. We practiced a lot of rhythmic patterns, chanting syllables - like sa, re, ga or plain aa." says Debashish. "Then we practiced the singing with hand-claps and working through different beat cycles, and in different scales or ragas. After five or six years we learned traditional compositions, in each raga there are something like 20-25 such compositions, and we improvise on the basic movements." "So I grew up with lots of Indian vocal music, and with the traditions of my country, and I was curious why I wasn't able to play that music with the guitar," he continues. "AT the age of six I was sent to learn Western staff notations from Rajat Kaku (Rajat Nandy), and Western style of guitar playing. I also would go to a relative Haru Kaku (Haradhan Roy Chowdhury) who played the sitar and the esraj- a bowed instrument, that is fretted like a sitar or sarangi. I attended his private classes, and I used to sit there, play there , and eat with him." 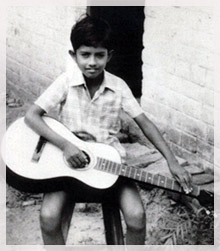 When he was nine Debashish began his experiments to imitate the sounds of sitar and esraj on his guitar. A little later he commenced formal sitar studies with Pandit Gokul Nag. Eventually Debashish's father arranged for him to meet Pandit Brij Bhushan Kabra, the pioneer of Indian slide guitar. " I left my family for 10 years to study with him in Ahmedabad, Gujrat, " says Debashish." Our relationship was that of guru and disciple. It was a rigorous training, with at least 12 hours of education and practice every day. I started thinking about incorporating the sounds of different instrumental styles in my guitar. The similarity of its sound to the human voice makes it peculiarly suited to Indian music - which is predominantly vocal-based."